Upgrade your spectrometers and carry out reliable atomic absorption, atomic emission, circular dichroism, fluorescence polarization, FTIR, mass, UV/Vis, and XRF spectroscopy processes. 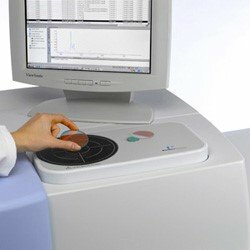 NETA Scientific provides a range of spectrometers, accessories, and components for improved applications in multiple spectroscopic studies. Ensure high spectrometer performance for optimal results in life sciences, biotech, pharmaceutical, and chemical research and development laboratories. Browse our selection of fluorometers, inductively coupled plasma, polarimeters, and more from industry-leading manufacturers.